Making My Stead: Happy Valentine's Day!... and More Heart Jewelry! Happy Valentine's Day!... and More Heart Jewelry! 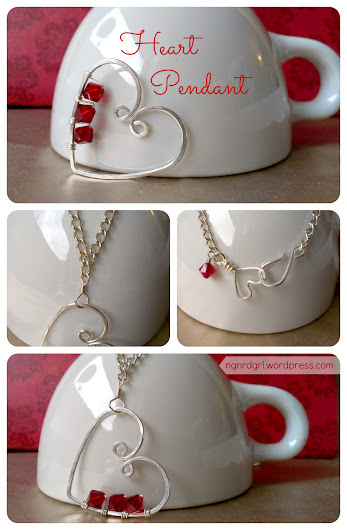 After my Heart Jewelry Inspiration post and my Heart Wire Jewelry, are you sick of heart jewelry yet? I kind of am! But I have two more pieces I want to share with you. Unfortunately, this post is more of just a show and tell. No step by step instructions. Sorry! This piece is made out of 16 gauge, Silver German Jewelry Wire. I started this piece almost exactly like my Heart Wire Hoop Earrings. I folded the wire at about 1/3 the length of the wire. I used the thickest part of my needle-nose pliers to create my round bumps. I crossed both ends of the wire to form the V part of the heart. I then bent one wire straight - this will be the wire that wraps around your finger. The other wire end was then wrapped around the other end and the excess was cut off. I wrapped the remaining wire end around a finger mandrel. Make sure to use a size or two smaller than what you want. I finished the end by making a P loop. This allows for my ring to be adjustable. I then hammered my ring to flatten it out. After getting the look I wanted, I moved the ring down the mandrel until it enlarged to the size I wanted. I hope that makes sense. Sorry I didn't take any pictures. I plan on doing a post or two specifically on rings at a later time. This piece is also made out of 16 gauge, Silver German Jewelry Wire. I used the same exact technique for the wire ring, except instead of wrapping it around a finger mandrel I made a wrapped O eye (tutorial coming soon!) to connect to the silver necklace chain. I then made a hook by wrapping it around a pencil mandrel in a similar manner to my Easy Peasy Earwires. 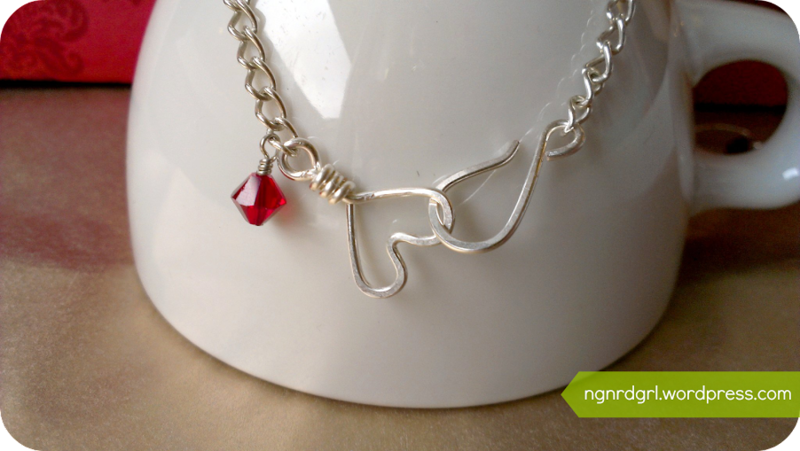 I attached a garnet swarovski crystal bead to the heart closure end so it will match my heart pendant. 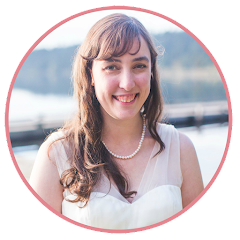 So head on over to A Crafter's Dream Group Giveaway for your chance to win! 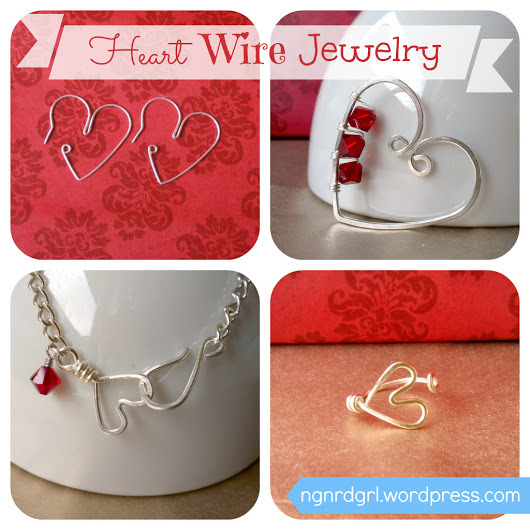 What do you think of my heart jewelry? Hope you loved it! 'Cause I am done with heart jewelry now! I think they are all beautiful! Most of all, those pics with the teapot are simply adorable! Happy Valentine's Day! I LOVE that little ring. I love pieces that you don't really realize what they are when you first look at them and they take a second to examine. Love that the heart is on its side the way it is. Super cute! These are all so cute! I love the ring! Thanks for stopping by yesterday and leaving me a super sweet comment on my 3D Heart Banner. I hope you have a wonderful Valentine's Day. VERY pretty. I had to look down at my hands and go oh lord I need some lotion ... lol stupid cold weather. Great job it's all beautiful. 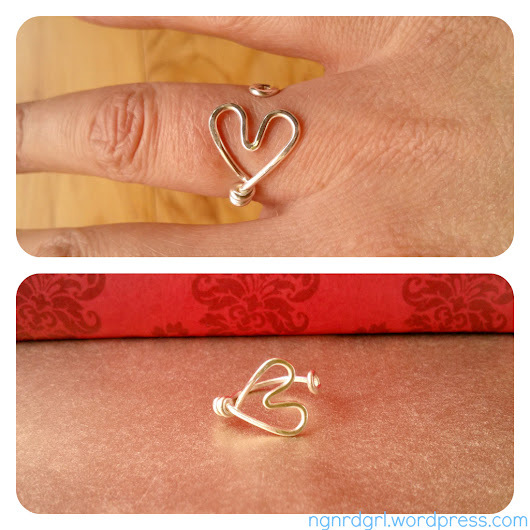 Your heart jewelry is awesome, and as a huge fan of rings, this one has to be my favorite piece! And it's totally something to wear year-round, dressy or casual.... Way to end the heart edition on a strong note! Happy Valentine's Day to you, Bethany. LOVE that heart wire ring! So cute! I'm totally with ya on the dry hands. During the winter, mine turn into decrepit, withered up, flaky dry hands! I love the heart ring! So cute! Thank you! I had a great Valentine's Day. Hope you did too! Cheers! Absolutely beautiful Bethany!! Love the ring!! Just so pretty, very cute! Wonderful tutorials! I loved all the outcomes! I just pinned these and also shared them on Facebook!! Thank you for sharing at Freedom Fridays Blog Hop and thank you for being one of my Five Faves!!! I just love your creations!!! Thanks for coming by my Thursday Link up Party to share this! Hope to see you again this week!